Shel: Maybe after Bright Side and Gus, Kim Holden must've known we needed something different, something lighter. Franco delivers on that; while there are some definite moments that caused me a little worry, I laughed and smiled more than anything. If Bright Side and Gus were soul searching, Franco was soul healing. Court: I think you're right, Shel. After the first two...we had no idea what this member of the band would bring us. I was really, really, really ready to cry is about all i do know. 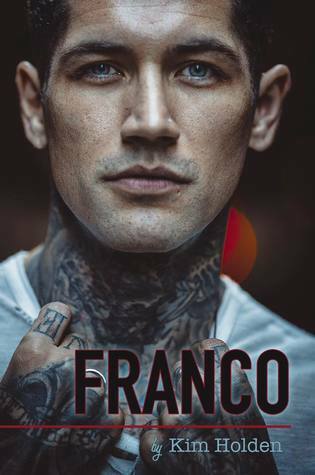 Franco is such a great guy, and he is an absolute delight to read, so I don't know why I was so worried! Shel: All in all, a really great "feel good" novel that just made me fall even more in love with this series and the members of the band. Court: YES! I am excited to see if the other two get their books, because they really could go in just about ANY direction because tbh, we don't really know a whole lot about what these two get up to in the books. A whole new world awaits us if we get them though, and I can't wait! Franco Genovese is the drummer for world renowned American rock band, Rook. He’s got it all. A killer smile. Tattoos. Talent. Razor sharp wit and humor. And a heart as big, and generous, as they come. Life is good. Steady. Uncomplicated. Just the way he likes things. Until one night at an unassuming L.A. bar changes everything. She’s a successful young architect from Northern England with an adorable smile, sarcasm for days, and an unparalleled trusting heart. It’s also temporary because they’ll both be heading home, thousands of miles apart from each other, in a few days. There’s something Gemma wants more than anything else. And when Franco propositions her to provide what she’s looking for, everything changes. Will it transform friendship into love, or will it be their ruin?